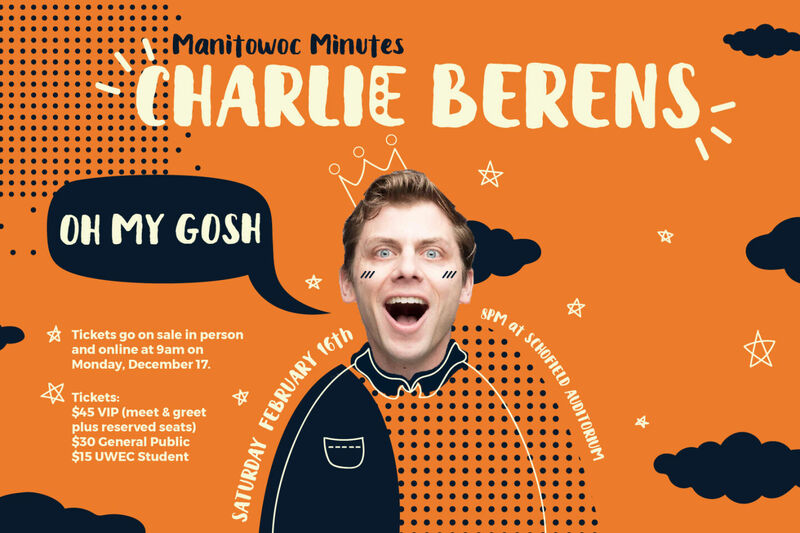 Manitowoc Minute’s Charlie Berens: Oh My Gosh! Da Manitowoc Minute is back on da road coming to your town real quick once. It's a brand new show that's one part Manitowoc Minute, one part Charlie Berens and three parts Craigslist. What could possibly go wrong? Get some tickets real quick once and keep 'er movin! Comedian, host, actor and Emmy-winning journalist Charlie Berens is a dynamic talent in the comedy world. Berens is the creator and star of the Manitowoc Minute. In 6 months he transformed the viral video series into an hour-long variety show selling out venues, sometimes within minutes. Charlie’s career extends beyond the Manitowoc Minute. From creating content for Funny or Die, TBS Digital and Fox Sports 1, to hosting shows for Fox, CBS Sports Network and Variety, Berens’ skill set proves invaluable in a rapidly changing media landscape. Born and raised in Milwaukee, Wisconsin, Berens has always had a love for satire. Growing up watching Jon Stewart and Stephen Colbert inspired him to study journalism at the University of Wisconsin. As a junior he was hired by MTV to cover the presidential election. That began Berens’ unique blend of journalism and comedy. After MTV, Berens hosted for the emerging comedy news platforms like OneMinuteNews and HyperVocal. He spent months on the road covering the presidential elections. In 2012, Tribune Media tapped Berens to host their late night comedic news show Nightcap. While at Nightcap, he then co-host Zuri Hall (E! News) wrote and produced sketch comedy. They would later use their experience in local news as inspiration for their scripted series Co-Anchor Confidential. In 2016 Berens sold the concept to LOL, a network partnership between Kevin Hart and Lionsgate. In 2014 CBS Sports Network hired Berens to host the sports gameshow You’re So Money. Also in 2014, PMC (Variety, Deadline) made Berens the host of their comedy/entertainment news brand @Hollywood. From red carpets to Sundance to SXSW to Coachella, Berens has interviewed hundreds of celebrities, politicians, actors, and musicians. In 2016 Berens turned his attention toward acting and developing his scripted shows. He found success at the Just For Laughs Festival where his Co-Anchor Confidential pitch was selected from 500 submissions. Hart then picked the series up at the JFL Pitch Panel. Berens is regularly featured on Funny or Die. His comedic mashups including “If Jack Dawson Was Really From Wisconsin” have garnered more than 13 million views. Additionally, he performs stand up around the Los Angeles area, and occasionally hosts events for Samsung and Variety. Berens is currently on tour with the Manitowoc Minute Live. Additionally he releases a weekly Manitowoc Minute Facebook video often getting between 400,000-1 million views.